Guest Post by Reveka – thank you! I took a class called “Informal Science Education” as one of my out-of-program electives, and the purpose of the class was to show teachers how to use informal science resources, such as museums, to teach science. One of our assignments was to write three consecutive lesson plans – one lesson being a trip to a museum – and I of course wanted to take a literacy approach. At first I couldn’t figure out how to do it! But then it hit me. We have so many non-fiction units, and we even have our second graders writing lab reports and all-about books that incorporate science into everyday things, so why not use the museums and resources to reinforce them! I came up with just a few ways in which we could include these informal science resources in our literary units, and maybe you can think of more! A museum trip during the nonfiction writing unit to make them “experts” on their topics! Writing Toolkits – Great for Conferring! Guest post by Nicole and Noelle — thank you! Conferring with writers in ways that are powerful and personal is truly a challenge. It is such a tall order to teach in ways that guide our children to achieve high standards, yet also meet them where they are and provide them with the individualized attention they need right now. If you’re like us, conferring with writers might be the most difficult part of teaching! You wonder what to teach, where those notes you took ended up, or where that great mentor text is buried! Conferring seems to come naturally for many teachers, but not for us! We realized we needed some help getting ourselves organized. So when we heard about toolkits, we were excited to create our own. Since then, we’ve been using our toolkits EVERY SINGLE DAY in our classrooms! They keep us organized and efficient as we confer. Above all, they have made a tremendous difference in the impact of our teaching. Okay, so you’re probably wondering how you can get your hands on one of these amazing toolkits! Well, the truth is you’re going to have to make it yourself. But the good news is that we can help you get started! Below we’ve shown some ideas and examples of what we’ve included in our toolkits. Of course, this is not an exhaustive list, but these are the tools that we’ve have found helpful as we confer with the writers in our classrooms. What you include ultimately depends on your preferences and your students’ needs. For instance, we use a three ring binder for our toolkits, but you may find another method that works better for you. In any case, we hope these resources will inspire you to get started on creating your own toolkits! Guest post by Marissa — thank you! As a third grade ICT classroom teacher, I find the use of read alouds to be a staple of my reading instruction. 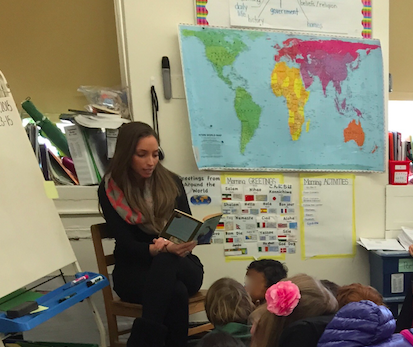 Read alouds can be used in a variety of ways to enhance literacy instruction. According to Richard Allington, (and perhaps all of us folks at TC), students must hear fluent adult readers to become stronger readers themselves. Read alouds are a great way to expose all children to a fluent adult reader. As students listen to the way a fluent and accurate reader reads, they too will mimic and engrain this characteristic into their own reading. I really like to incorporate voices, tone, feeling, and even add a bit “drama” into my read alouds. Not only does the book become more alive and engaging, but also students truly hear what a fluent reader sounds like. Guest post by Hannah — thank you! 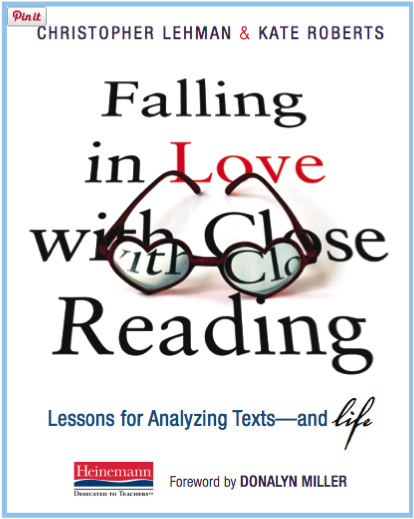 In Falling in Love with Close Reading, Lehman and Roberts describe a simple process and method to teach close reading to upper-elementary, middle school and high school students. They do so by inspiring the reader to study texts deeply, as if they were the people and places they love the most. For a teacher like me, with a limited background in English Literature, the book provides an extremely helpful review of the literary elements and structures that we need to teach our students. Lehman and Roberts suggest following a ‘ritual’ when close reading texts. Throughout the book, the authors return to this ritual each time they embark on close reading, regardless of the focus of the reading. This ritual is very user-friendly for both teachers and students because it outlines a path of specific and consistent steps to follow. Along with providing a general framework for close reading instruction, the authors provide lesson plans and practical tips to use with students. For example, they offer ideas for tangible scaffolds such as sentence stems and anchor charts to help students with abstract concepts. The authors also make suggestions for ways to increase student engagement such as by incorporating pop culture, students’ interests and video clips into close reading instruction. Connections to the Common Core State Standards are present throughout the text and are very helpful. This is an exceptionally practical and clearly written text. It’s a must for all upper-elementary, middle school and high school ELA teachers. Guest post by Shipnia — thank you! Guest post by Anna-Kay — thank you! As teachers we play many different important roles. We’re nurses, mathematicians, scientists, historians, meteorologists, and sometimes stand in mommies. We wipe tears, tie shoes, halt arguments or fights and must always keep it all together (and we do). We are practically real life superheroes! But what do we do on those days when it seems everything is falling apart? As with many superheroes, teachers often forget to take off their superhero cloaks and put on their bathrobes and fluffy slippers. Even superheroes become overwhelmed and must retire to their fortresses of solitude in search of methods to tame their stress. Here are some tips and tricks that have been successful for me when I feel I am being taken over by the stress monster.